The Commonwealth of Australia has awarded global defence contractor Austal a $305 million contract for the Pacific Patrol Boats Replacement (PPBR) Project. The contract will see Austal construct 19 steel-hulled patrol boats valued at $280 million – with an option for two additional vessels – and provide sustainment support for an initial seven year period valued at approximately $24 million. According to Austal, design work will begin immediately, with construction to commence in the second half of 2017. 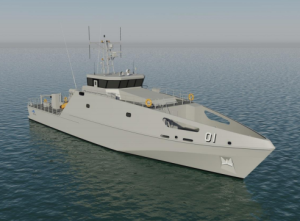 The vessels will be constructed at the Austal’s shipyard in Henderson, WA, where the company is currently completing construction of the second of two 72 metre High Speed Support Vessels for the Royal Navy of Oman, and two additional 58 metre Cape Class Patrol Boats for the Royal Australian Navy. According to the company, the PPBR contract award will secure approximately 120 direct jobs plus many more in local and Australian subcontractors who have worked with Austal extensively over the years. Support work will be carried out at Austal’s existing contracted facility in Cairns, Queensland, which will engage local subcontractors in the region to deliver support services. The company’s CEO David Singleton said the contract validated Austal expertise in designing, constructing and sustaining patrol boats for domestic and export customers. “Austal has consistently proven its credentials as an efficient prime contractor and shipbuilder of quality aluminium vessels and we look forward to translating that expertise into the design and construction of steel-hulled vessels,” Mr Singleton said. He said that the contract also opened up new opportunities for the company to further develop its successful export programs, which have accounted for up to 80% of Austal’s production in the past. “The continuous build program adopted by the Australian Government for the PPBR and planned for other program delivers the Government and taxpayers a more cost efficient vessel construction process as well as sustainable and continuous employment in Henderson which creates the bedrock for further growth,” Mr Singleton added. The all new Pacific Patrol Boat is based on Austal’s proven patrol boat design platform and is 39.5 metres long with a beam of 8 metres and a loaded draft of 2.5 metres. It is capable of travelling at 20 knots, while at 12 knots it possesses a 3,000 nautical mile range. Each vessel can accommodate 23 people.